The recipe on the internet is regular cheese flavor. So (of course) I need to chocolatify it. I chocolatify whatever and whenever I can. One can never get too much chocolate. I’m sure I’ve mentioned it before somewhere before. Prepare an 8″square pan by lining it. Preheat oven to 150c. Put the milk, butter and cheese in a medium pot and heat gently until everything is melted. Then add in the cocoa powder and instant coffee. Let it cool down first before adding in the egg yolks and flour. Mix till well combined. In a really clean, oil-free bowl, whisk egg whites until foamy. Then add in the sugar and continue whisking until stiff peaks form. Usually I flip the bowl upside down to test. The egg whites should stay put in the bowl. Scoop out about 1/4 of the whites into the chocolate batter to lighten it. Then pour the chocolate batter into the whites and mix well using a whisk. Pour out into an 8″ square pan. Give the pan a few taps to get rid of big bubbles if you are concerned about holes in your cake (like mine). Bake, bain marie style, in a preheated oven of about 150c for 50 min. It will puff up like a pillow but when cooled, will deflate and give you a nice flat surface for frosting. *You must be wondering about the curtain clips. Haha. It’s my Ikea stainless steel curtain clips. I find that it is great for keeping the paper in place. I didn’t frost it this time round but here’s a quick and easy way to make the frosting. Heat up the cream. When hot, add in the chocolate and stir until melted. Cool it a little and then just spread on the cake. This cake may be enjoyed warm or cooled. It doesn’t need to be chilled before you can dig in. I think that’s wonderful. I got this idea from a cheesecake my good friend gave me. I thought the apple pie cheesecake was really nice. Only thing was that there wasn’t enough apples. I want an apple pie cheesecake that is chock full of apple pie filling. I don’t know where to get that. So, as always, if I can’t find it, I’ll have to make it. It’s my same basic cheesecake recipe but with an extra step. That extra step is to make apple pie filling. Which really isn’t difficult. Skin and cube the apples. Cook them in a pot over the stove with sugar and cinnamon until the apples are tender. This won’t take long. Do make sure to keep an eye on it and stir constantly to prevent it from sticking or burning. Leave it aside to cool. Crush the biscuits and mix with the butter. Press crumbs onto an 8″x 8″ lined pan. Pop it into the oven to toast for about 10 min at 150c. Cream the sugar with cream cheese until smooth. Add in eggs, one at a time, making sure batter is well mixed with each addition. This is to ensure minimal lumps. Add in lemon juice, flour and baking powder. Lastly, fold in the apple pie filling. Then pour the batter on top of the biscuit crumb. Bake bain marie at 150c for about 30 min. Leave oven door ajar and let it cool down in the oven for a couple of hours. Then refrigerate. You know how it is that when you ask, let’s say, an Elderly Person how she cooked a certain dish, she would say vaguely add a bit of this and a bit of that? I used to wish that they could be more exact coz I had a need to be exact. I needed to know if it’s 1 tsp or 1 1/4 tsp. I was obsessed with accuracy. To the point of being uncreative ‘coz I was afraid of deviating from the recipe. Oh the insecurities of my youth! Recently, it dawned upon me that I have become that “Elderly Person”. I find measuring everything accurately so tedious. But since I want to pass on my recipes to my kids, I am making the effort to keep a record, as precisely as I can. ‘Coz I understand the obsession of the youths for exact details. 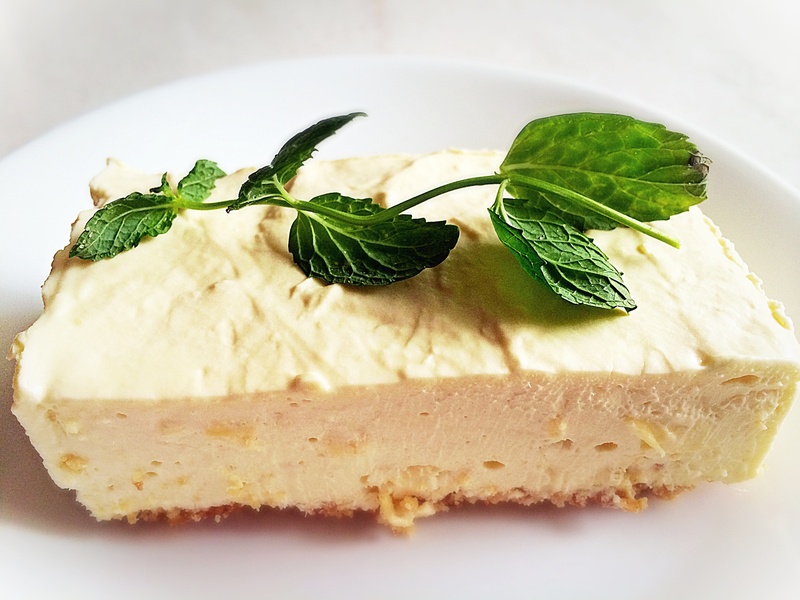 Recently, I made a no-bake cheesecake without a recipe. It is actually not complicated. 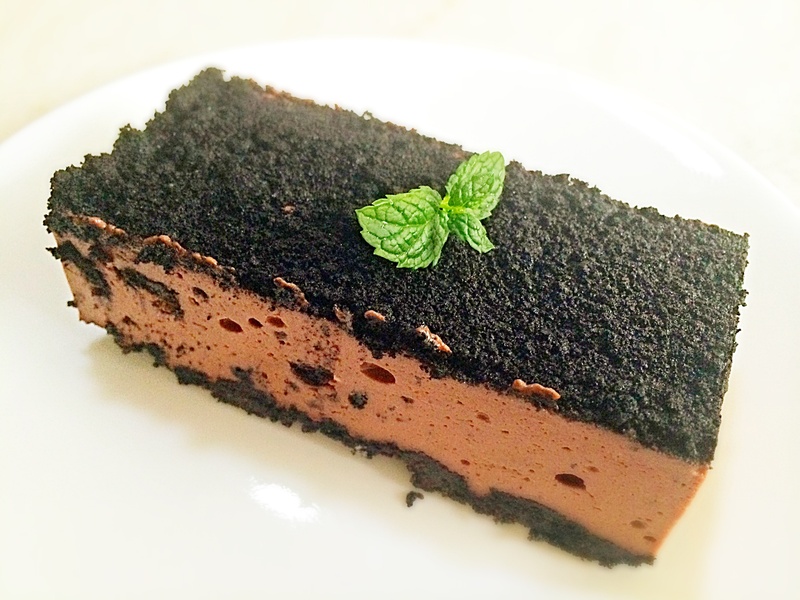 I had planned to make a Hazelnut Spread Cheesecake (I still have that one last 1 kg bottle of HS *see previous post). When I opened my larder, there were those Oreos sitting there. Lately my kids brought home a ton of Oreos from school. So I decided to use them up ‘coz usually nobody eats them. Then I spotted my new 1 kg bag of cocoa powder (yes, i buy cocoa powder by the kilo coz I am not familiar with the logic of buying in small quantities). As I took them out, I found my long lost gelatine. “Lost” ‘coz I had totally forgotten about it. Armed with these, I then made it up as I went along. No-bake cheesecake recipe can’t go wrong if you know the basics. Generally, the quantity of gelatine is about 1/2 to 1 Tbsp per 2 blocks of cream cheese. If you plan to add things like yogurt or cream or hazelnut spread/peanut butter, then use 1 Tbsp. Bloom the gelatine in hot water for a few minutes before using. Use sugar to sweeten if needed. Then just whisk everything together until smooth. As for the base, it’s just crushed biscuits. If the biscuits are plain-ish, add in a little butter for richness. If you are using Oreos, it already comes with fat (the stuffing in the middle) so you don’t need to add anymore. Just crush them any way you like. Finely or coarsely, it doesn’t matter. I just whack them with my pasta sauce bottle straight from the packet. Then I cut open the packet and pour it straight into the pan. Less washing up is always encouraged in my home. Extra Oreos for adding into the cheesecake and for topping. Line an 8″x8″ pan. Put crushed cookies at the bottom of the pan with 2 spoonfuls of hazelnut spread (optional). Mix them up and press them onto the pan. Put aside for later. 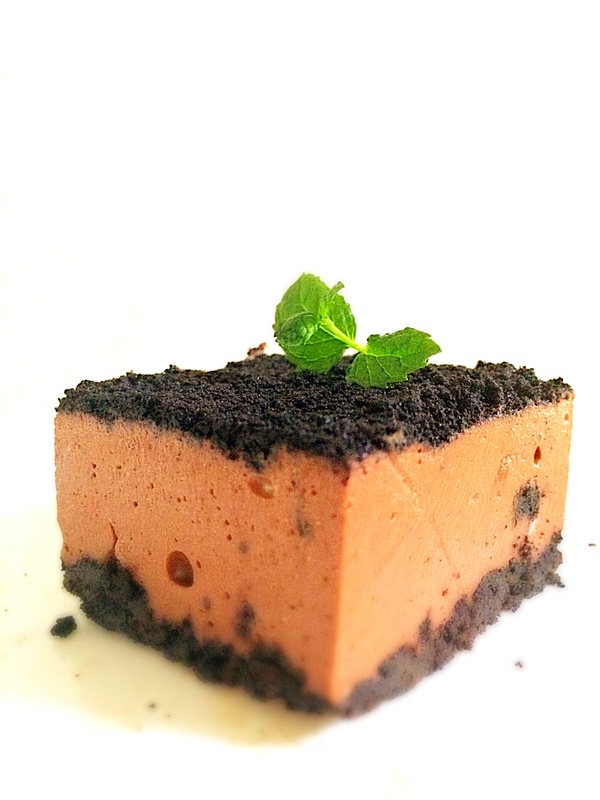 Beat cream cheese with cocoa mix, bloomed gelatine and hazelnut spread until smooth. Stir in Oreo chunks if desired. Pour into prepared Oreo base. Sprinkle top with Oreo crumbs. Chill in the fridge until firm. Simple and quick to prepare. No need to weigh ingredients carefully, thereby getting to the end product sooner. The only thing that takes up so much time is the waiting part. Which you must. ‘Coz eating it when well-chilled is totally worth the fat space.